Perhaps one of the most difficult tasks for a developer is converting an RPG from PC to consoles. Substantial changes have to be made to accommodate a more limited control setup, mostly with regards to the heads-up display, while broadly-scoped adventures may not be technically possible to render on a console. CD Projekt, however, take up the challenge and knock it out of the ball park with The Witcher 2, coming to 360 with very few sacrifices. Bringing all the improvements from the updated version, while translating a magnificent experience almost flawlessly, TW2 is simply a must-own game for 360 RPG fans. Gamers reprise the role of Geralt, who’s suffering from a decent bout of amnesia. In prison and bearing the brunt of torture and snide remarks, the white-haired hero is eventually interrogated by ex-comrade Roche. 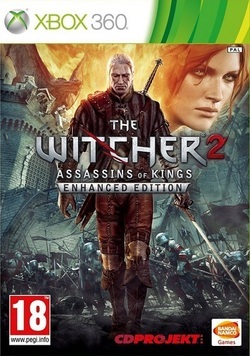 This allows Geralt to tell both Roche and (by extension) the player about the events which led to this point, depicting an assassination of a king. After a brief escape, a journey commences whereby Geralt must prove his innocence by finding this assassin of kings. Those who haven’t played the first game may feel confused, with no kind of prelude to help you. But you’ll soon get over this, thanks to some extremely stellar writing and fantastic characters. More impressive are the decisions you can make – rather than simple illusions of freedom, choices in both how you speak and what actions you take will affect both short-term and long-term events, and it’s incredible to watch how one small action changes the entire course of your adventure. All together Shenmue fans: "Do you know where I can find some sailors?" Geralt’s journey takes place over five chapters. Each chapter has you situated in a single sizeable area, filled with both main quests and side missions. As you progress, a main overall objective remains with you throughout, while story missions between each chapter contribute to this goal. Main missions are lengthy affairs, involving multi-stage objectives which change as you make progress. Some of the more exciting missions have you defending a city from an impending invasion or re-enacting a historic battle to restore a cursed land, and the story missions do a good job of keeping you engaged. The side-missions can vary; some are bland tasks such as collecting items from a specific enemy, while others are more in-depth, including a descent into a cursed tomb which features different outcomes affected by your choice, and these are far more enjoyable. Real-time combat provides much of the game’s challenges. You can focus on one enemy with the game’s lock-on system or simply swing without it and hope to connect. Geralt comes equipped with two swords, a full set of armour and can acquire other special items such as bombs and traps. Swords have strong and weak attacks, as well as other moves through upgrading. Geralt also has access to Potions and Sign attacks. Potions add special effects, such as stronger sword attacks or being able to see in darker areas. These potions can be either bought or brewed through alchemy. Swords and armour can also be crafted using Blacksmiths in each of the areas you visit. Sign abilities let you cast special spells such as fire attacks or possession. Combat works well, with the potions ‘n’ powers adding a good amount of fun and depth to the action. The only issue is sometimes enemies will glitch out, allowing you to hammer into them without any kind of reaction. Levelling up Geralt unlocks Talent points. These can be applied to four different trees. You have a basic branch, allowing you to unlock basic moves such as the parry block, as well as trees focusing on swordsmanship, alchemy and signs. Trawling through these upgrades allows for some nifty moves, including the Riposte - essentially a deadly counter-attack manoeuvre. Mutagens can also be applied to special ports to, for example, increase Geralt’s health, but because Mutagens are also necessary for casting potions, you are forced to find a balance or be sorely lacking in either potions or upgrades. Because you can’t max out all the skills, there’s a good deal of depth and weight to each upgrade decision you make, and the cool abilities available are satisfying to master. Other light gameplay aspects also come into play, though they’re hit-or-miss. Stealth sections are included in certain missions, and while they add variety, they’re pretty basic. Most require you to simply knock an enemy unconscious, and guards won’t even react to nearby unconscious bodies. Light mini-games come into play too, allowing you to win money through Arm-wrestling and Dice games. These mostly serve as light, but inoffensive, additions to a meaty role-playing experience which will take a good 30 hours to complete, and considering how choice impacts the game significantly, you’ll probably feel enticed to go through again. It’s worth noting that this version comes with all the additions of the PC’s Enhanced Edition, including hours of new missions, new cutscenes and lots of fixes, meaning it’s a definitive version. 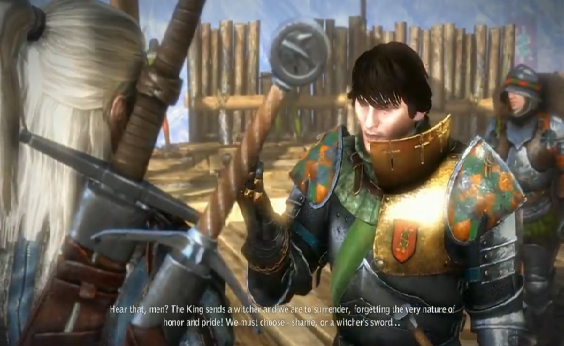 TW2’s fantastical world is brought to life by the stunning graphics engine. A solid conversion of the spectacular PC version, the detail that both characters and the environments show is incredible. Most of the lip-synching is absolutely spot on, immersing you into the story. There are some oddities with animations and frame-rate issues, but CD Projekt should be commended for the remarkable job they’ve done of converting the game to Microsoft’s console. The audio is even better: the fantastic voice acting brings characters to life, excellent music suits the action and intensifies the experience while the sounds for casting spells, sword combos and the gruesome execution kills are great. 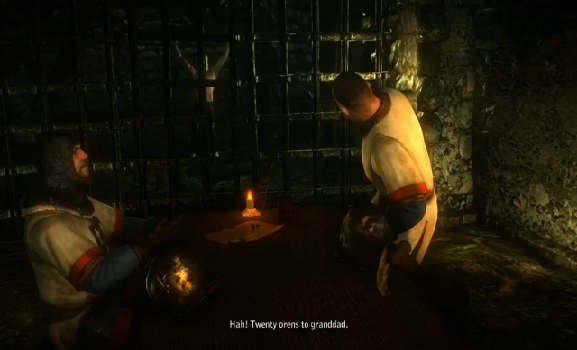 The Witcher 2 is a spectacle for a myriad of reasons. Challenging, morally ambiguous choices are a frequent occurrence throughout, forcing the player to struggle with the good and evil inside them. The fact that the story is filled with such memorable characters and interesting dialogue means you’ll have an even harder time making these tough decisions. Story missions are engaging, and while some of the side missions feel a bit menial, others could be full-fledged main missions. The rock solid combat, fantastic presentation and deep RPG mechanics all make The Witcher 2 one of the best RPGs you can get, and CD Projekt should be lauded for the game's smooth transition from PC to console.